This, along with comparisons to birthday parties we’ve been invited to, I fall deep into the minority. 12% spend less than $100 – I guess that’s where I fall. Last year my daughter wanted a Mickey Mouse pinata. I totally made one by hand. It’s wasn’t all that pretty, but it delivered candy just fine. I find cake decorating a fascinating challenge so they are always homemade. Jeez, just cleaning the house and rearranging furniture for the party is a lot of work. 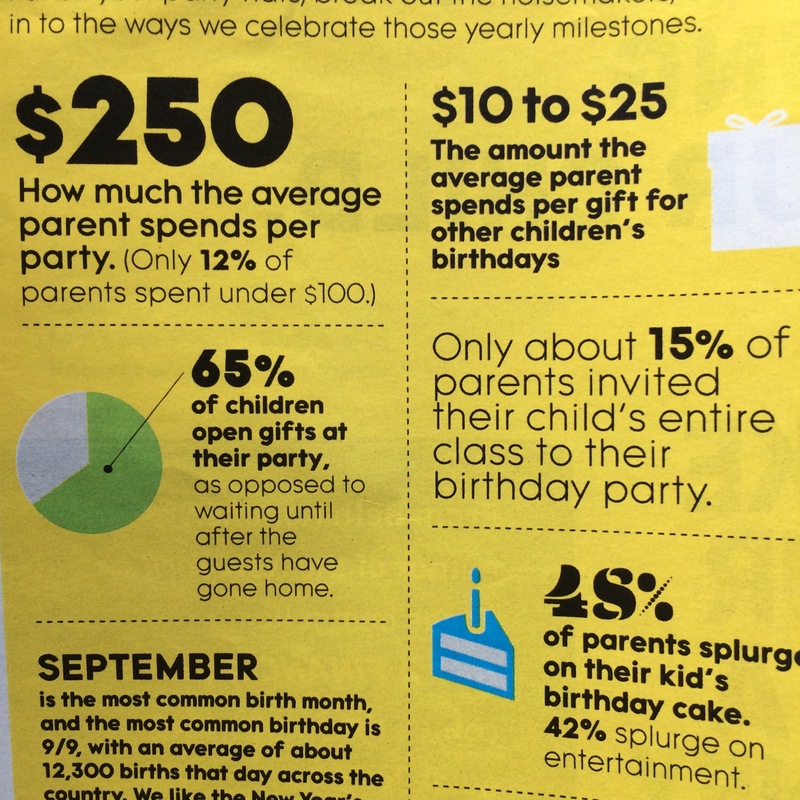 I’m going to sound old here – and say When I was a kid, we had pretty modest birthday parties. While my Mom did throw me parties, generally only 2-4 kids were invited, she made cake out of a box (maybe even serving it still in the pan), and there weren’t many gimmicks. Maybe a homemade game, a sleepover, a sprinkler. Presents wrapped in newspaper comic sheets. But I LOVED it! I still felt special. My friend Maggie’s mom made an awesome scavenger hunt for us once, leaving clues all over the neighborhood. Occasionally when we were older we might go bowling, or be let loose at my church fair. But that was when I was like, 15. Certainly when I turned 5 or 6, it was a small affair. I remember being SO excited when I was gifted a box of 64 Crayons – with a sharpener in the back! It was such a hot gift, two different people gave it to me that year. A BOX OF CRAYONS! What would my kid say if I just gave them that nowadays?? Heavens to Betsy what would ANOTHER kid say if we brought that as a gift to their party? We’ve attended parties with bouncy houses (wet or dry), catering services such as cotton candy/popcorn/ make your own pizza, face painting, various arts and crafts, a pool with a hired lifeguard, and of course parties on location such as the beach, a water park, and Happyland. There are professional cupcakes surrounding the professional tiered cake, and goody bags (ok I think I got goody bags even as a kid). What work we parents put into these events! Let me reiterate, we have super fun going to these. The birthday kids seems to love it too. My kids BEG for a bouncy house, but I’m going to be honest and say I love the fact our yard is too small, and I whip that excuse out every time they ask. I just can’t bring myself to go that lavish. Call me a cheapo. I don’t want to spend that much money, but I’m also afraid that my kids will be spoiled (sometimes I’m paranoid). But mostly cheap. Although, I’ll admit I enjoy making a ‘theme’ for their parties. This entry was posted in Uncategorized and tagged birthday, bouncy house, cheapo, inflables, parties. Bookmark the permalink. I can so relate to this! My girls are 21 and 23 now so it has been quite awhile, though, haha. I was always doing things on the cheap and made boxed pan cakes and had the girls help decorate it. When they were very little, like 3-5 there was a second hand store for children’s things which I purchased some toys from. Hit the Dollar Store for little things like stocking stuffers but they seemed to be thrilled anyway. I always made their Halloween costumes, as well which was fun!